Get to Know a CFCR Volunteer! This time, we get to know long-time multicultural host, Frances Fortugno! Frances has been around CFCR since our humble beginnings. 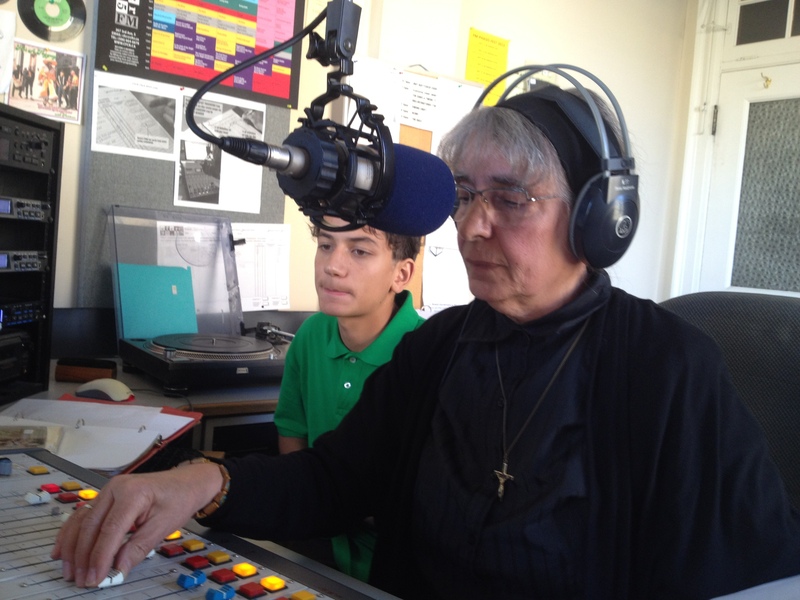 2016 marks 25 years of broadcasting for CFCR, and to celebrate we’re excited to highlight a host like Frances, who has been involved as a volunteer at the station even before we started transmitting a signal! Frances has been one of our most committed and reliable hosts during her time with the station, broadcasting her Italian-language program Azzuro each and every Sunday from 4-5pm. She has always been an active member of our parent community radio society (The Community Radio Society of Saskatoon (CRSS)), and attends most of our Annual General Meetings and other volunteer functions. How did you first come to learn about CFCR? I have been with CFCR since the early days of meetings to discuss the establishment of a Community Radio Broadcast Station in Saskatoon. A representative from each component of the Saskatoon Heritage Language School, sponsored by the Saskatchewan Multicultural Association, was invited to attend these preliminary meetings. I attended on behalf of Saskatoon Italian School and have admired all the work done by the founding members and especially all the work done by lawyer, Jeff Lee, to make CFCR a reality; and I continue to admire the dedication and work of all the Directors, Staff, and Volunteers! Why do you volunteer? Why is CFCR important to the community? As a representative of the Saskatoon Italian School, I thought it was a great opportunity to be part of the weekend multicultural programming and provide an extra resource for students of Italian School and for other interested listeners. In 1987, not knowing anyone experienced or wanting to run an Italian show, I volunteered myself, also not knowing anything about hosting a radio show. Little by little I managed to overcome my fears; and 29 years later I'm still volunteering. Over the years I have appreciated the co-hosting by a few Italian-speaking friends who were temporarily in Saskatoon. What’s the craziest thing that’s happened to you on the air? I recall various things going wrong for me as I have ventured to learn to host my radio show, which I named Azzurro, the title of an Italian song which I have always liked and which I chose as the introductory theme music. Over the years, besides trying to build up my courage at the control board, I recall such slip-ups as pushing the wrong button and causing "dead air," failing to turn on my microphone before speaking, pushing "play" for a tape only to realize it is cued on the wrong side, forgetting to bring my program plan, bringing a specific CD I planned to use only to realize I had only the jacket! What’s your favourite CFCR show(s)? When I find time I enjoy listening to melodic music and listening to other multicultural shows on CFCR. Who is your favourite local band? Non-local band? I enjoy the music of the local bands Gabe Penna & The Rising and The Puppets, and the music of non-local band Blue Rodeo. Aside from radio, what else do you like to do? Besides radio, since my retirement from teaching in French Immersion Schools and in Italian School, I enjoy spending time with my grandchildren, helping as a member of the Italian Canadian Association of Saskatoon, taking photos, reading good books, watching TV, especially EWTN. What’s your favourite/least favourite pizza topping? My favorite pizza topping would be three cheeses, pepperoni and pineapple. What’s the best book you’ve read or movie/show you’ve seen recently? A great book I have recently read is Mother Angelica by Raymond Arroyo, the amazing story of the founder of EWTN Television and Radio Networks! Here's a short list of some of Frances' favourite songs, which have likely all been featured at one time or another on Azzuro! Who should we feature next time on "Get To Know A CFCR Volunteer?" Let us know who your favourite CFCR host or volunteer is and you could win some great prizes! Just email us at info@cfcr.ca and we'll take it from there. Be a part of the community at CFCR by volunteering! You can apply to be a host and pitch your show idea --- OR you can be a part of the CFCR Army of Volunteers! You could be the host of one of our existing daily/weekly programs (like Green Eggs & Ham, The Buzz or The Swing Shift), or you can pitch your own idea for a show to CFCR Program Director Jay Allen. You can contact Jay at the station at (306) 664-6678 or by emailing pd@cfcr.ca.Your friends and neighbours will envy you. You may even be featured here, for all the world to see! It’s fun and it helps both the station and the community-at-large. And if you just want to help out in the community or around the station without hosting a show, shoot a message to CFCR’s Volunteer Coordinator at volunteers@cfcr.ca, or call at 306-664-6678, and the next time the station needs an extra set of hands, you’ll hear from us.